Chalk Paint is very rewarding to work with. In just a few quick steps, transform forgotten furniture into new statement pieces that can refresh any room. There is no sanding or priming required, and an array of techniques that can make it personal. Try a relaxed whitewashed look with lighter creams and ivories, or a go for impact with a juicy jewel tone. Whatever your treasure, here’s how to make it happen when you’re ready to commit. Use a damp cloth to wipe dust and smudges from the surface of your furniture piece. For the sharpest results, remove knobs, handles and hinges. This will be helpful if you plan to re-use them, and without them, you can be more free in how you apply the paint. 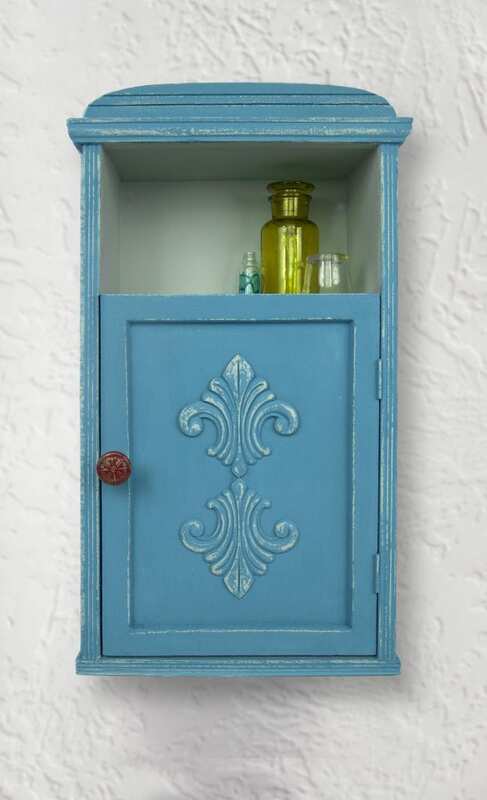 Or, if you’re going for a distressed look, leave the hardware and paint over it too.. Always test first on an inconspicuous corner or piece of scrap wood, to be sure of the colour and effect. 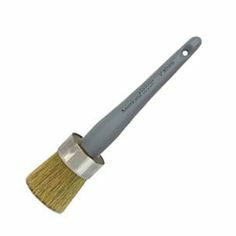 We highly recommend using the corresponding Americana Decor paint brushes to apply the chalk paint, which have been perfected to achieve a smooth, even finish. Depending on the size of the piece, the 2” flat brush should do the trick. Be sure to paint in the direction of the wood grain. Apply paint in thin coats. It will dry faster and smoother. 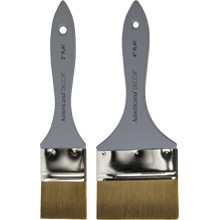 If you notice any unwanted brush strokes, break out the sandpaper and buff away brush marks between coats. 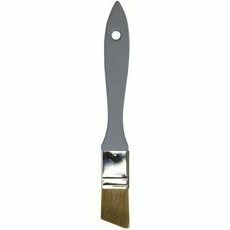 Consider switching to a mini-roller instead of a paintbrush where you need a flat, level finish most, for example, on table top surfaces. Distressing with Water – Within 15 minutes of applying the color, take a damp cloth and rub over desired areas to expose surface below. Distressing with Sandpaper – Once the paint is dry, gently trace along the edges using a fine (220) grit sandpaper or sanding sponge. Any ornate detail in the woodworking can also be sanded to show off its shape. Oops. If you sand a little too hard and make a big scrape, no worries. Just dab a bit more paint back on to even it up. Don’t use steel wool to distress your piece. It will leave a grey tint. Similarly, dye will seep through any coloured rags, so make sure you work only with white ones. Step #4. Wax or Varnish? Start with the dry, painted surface, being sure to again remove any new dust with a damp cloth. Then, pick your polish. Finishing Wax is a great choice to give your piece a hand-rubbed luster, and is available in Clear and Deep Brown. A varnish will give added durability. Finishing in the Clear Wax will give the surface a lovely smooth texture, soft to touch, not to shiny, not too flat. First, apply an even coat of the Clear Crème Wax wax with the Wax Brush, and immediately wipe away with a clean, dry cotton rag or lint-free towel. (Old T-shirts work great!) Right away, the wax will deepen to a polished “wet look” that is very soft and smooth to the touch. For larger surface areas, brush and wipe the wax in the full lengths to avoid uneven spots. 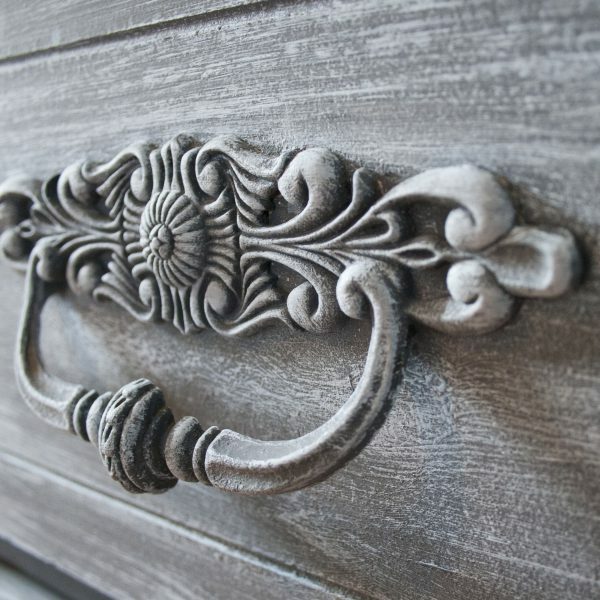 Cover knobs and drawer pulls with the same wax if you’ve painted the hardware too. If you’re up for something that’s a little “shabbier” chic, skip the Clear Wax in favour of the Deep Brown, which will muddy it up a little more for a true time worn look. If you feel it’s too dark in any particular spot, just wipe on a bit more of the Clear Crème Wax, and it will counter the effect of the dark.You can also buff the Darker Crème wax with a white cotton cloth for added sheen. Depending on the piece and how much use it will get, you may want to use a varnish in place of the Creme Waxes, for extra durability and protection. The varnish is available in a choice of three sheens: Ultra Matte (zero sheen), Light Satin (just a hint of sheen) or Soft-Touch (velvety finish and feel). Soft Touch Varnish: For pieces that will be used outdoors. Light Satin Varnish: Resistant to scratches, fingerprints and household cleaners, outdoor safe. Ultra Matte Varnish: Get a dead flat, no-glare polyurethane finish, with all the benefits above. Ultimately, you can’t go wrong. Whichever colour or technique you go with, whatever piece you decide to restore, you’ll have made your very first one-of-a-kind.